One main reason why you would spend the time and effort to create an efficient context for your digital photos is to be able to search for them. Search results and image metadata go hand in hand. In other words, you can’t have meaningful image search results if your pictures don’t have meaningful image metadata. As I have written before, creating a meaningful image context can be done in layers since not everyone has time to do all three layers. So, even if you create only meaningful folder names for your digital pictures, Picasa can still find your pictures quickly. Searching in Picasa is one of my favorite features. Read on to see how you search for pictures with Picasa. If you have been reading around my site you probably have seen the simple acronym I use to describe my entire photography workflow. I use the simply acronym S.T.O.R.E (Shoot, Transfer, Organize, Retrieve and Export) to describe all the steps of my photography workflow (Read “How I organize my digital pictures”). Out of all the steps, I have written the fewest articles about retrieving photos. 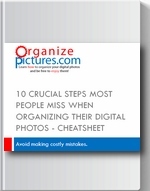 It’s not because I have forgotten to write about it, but actually because if the other three prior steps are done properly, then searching and retrieving your favorite pictures becomes very simple. If you have spent the time and effort to create an efficient context (Read “Easy steps for making your pictures memorable”) for your images then things should be easy. Any decent software should be able to help you find your pictures quickly. This is true about most software programs, but with Picasa search is simply awesome! So, the only step required for efficient image search results is to create an efficient context for your digital photos. That’s it! Once you do this, Picasa will do the rest when you search. It’s true that my entire site is dedicated mostly to being able to create an efficient image context for your digital photos. So it’s not a simple step, but it is the one necessary step (consisting of many other steps) to make searching for your digital photos very easy. In addition, with Picasa, searching is fast…very fast. Searching with Picasa is probably one of my favorite features. It’s awesome…it’s like having the entire power of Google internet search on your desktop. Picasa has a very efficient and fast search algorithm. Did I say searching in Picasa is fast? Yeah I did ’cause it’s fast, really fast! How to search for digital photos with Picasa. I like the fact that Picasa presents the results instantly and in a logical manner. Searching for your digital pictures in Picasa is super fast! For example let’s say I have some pictures with the keyword “birthday” but I also have the word “birthday” in some folder names. When I search for pictures with Picasa and type “birthday” in the Search box, then the pictures with the keyword “birthday” appear first and then the folders with “birthday” in the folder name appear next. In addition, on the left side where you normally see your folders, when you search for a keyword, Picasa will actually show you the folders containing the pictures that match your search criteria. It’s really cool. The timeline slider and various buttons allow you to filter your search results even further. You can further filter your search results by using the timeline slider which will give you fewer results the closer you get to today’s date. In addition the various buttons to the left of the slider give you the option to only search for images, videos or starred images. That’s pretty cool. 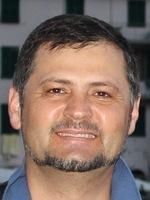 In conclusion, searching for your digital pictures in Picasa simply works and it works very fast! It’s true! But there is one thing missing…I’m not sure why, but it is missing. What is missing from the Picasa Search is the ability to only search by keywords and exclude folders. 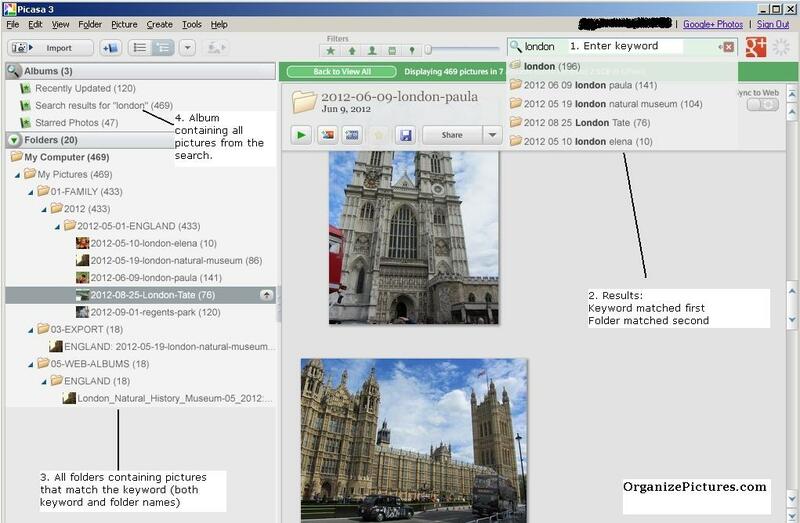 Currently, Picasa will show you search results matching keywords, folders and image captions. This is cool but what if you only want the pictures filtered by your keywords? Well, you can’t filter anything out. That’s too bad! Try “underscore”, meaning “fall_leaves” …it seems to make a difference. Let me know. I too love Picasa for all of its features (that you have introduced me to.) This is a neat, but the one thing that I discovered about keywords is that they work best if they are one word. In other words if I tag a photo with “fall leaves” as I type “fall” then “fall leaves” will show up, but once I continue with ” l” then the list starts to add in keywords beginning with “l”. And if I finish the word “leaves” then it only shows anything if the words “leaves” is a keyword on its own. So I have to remember to stop and look at the keyword results before completing a multiword keyword. Also, I wish I could use some logical joining to help filter better, like show me all the photos tagged with “flower” AND with “Chicago.” It is surprising to me that the most awesome Google search company didn’t build this capability in from the outset. The other thing I have mixed feelings about is that when you type in the search box it returns result hits from both keywords AND file/folder names. That is good at times, but I wish I could choose to just search keywords only. For multiple word keywords I recommend using a hyphen in the keyword. Using your example with “fall leaves”, I would create the keyword “fall-leaves” instead of “fall leaves”. The IPTC standard expects one word keywords and that’s what Picasa is returning in the search. You can easily do “joining” of keywords by using a comma between your keywords. However, the results seem a bit confusing because it shows you the folders as well. I agree with you that showing folders as well can be confusing…but again that depends. It would be really nice to be able to change some configuration to exclude or include folders in the search results.